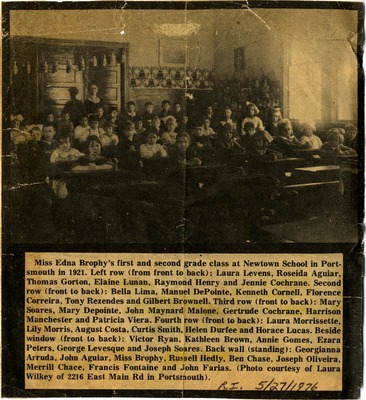 "Miss Edna Brophy's class, Newtown School"
Transcription: "Miss Edna Brophy's first and second grade class at Newtown School in Portsmouth in 1921. Left row (from front to back): Laura Levens, Roseida Aguiar, Thomas Gorton, Elaine Lunan, Raymond Henry and Jennie Cochrane. Second row (front to back): Bella Lima, Manuel DePointe, Kenneth Cornell, Florence Correira, Tony Rezendes and Gilbert Brownell. Third row (front to back): Mary Soares, Mary Depointe, John Maynard Malone, Gertrude Cochrane, Harrison Manchester and Patricia Viera. Fourth row (front to back): Laura Morrissette, Lily Morris, August Costa, Curtis Smith, Helen Durfee and Horace Lucas. Beside window (front to back): Victor Ryan, Kathleen Brown, Annie Gomes, Ezara Peters, George Levesque and Joseph Soares. Back wall (standing): Georgianna Arruda, John Aguiar, Miss Brophy, Russell Hedly, Ben Chase, Joseph Oliveira, Merrill Chace, Francis Fontaine and John Farias. (Photo courtesy of Laura Wilkey of 2216 East Main Rd in Portsmouth). R.I. 5/27/1976"